A full line of industrial-duty precision pliers that are lightweight, well balanced, and comfortable to hold with tips designed for special assembly, repair, and DIY tasks is available from Xuron Corporation of Saco, Maine. Xuron® Precision Specialty Pliers are manufactured from high carbon steel and have a slim profile with perfectly aligned tips that are designed to perform specific assembly, wire bending, forming, and parts holding tasks. 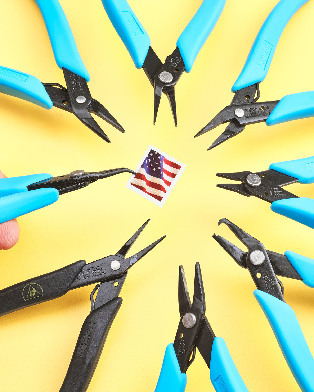 Featured are the TweezerNose™ pliers that can pick up a human hair, the Bent Nose pliers, Long-, Short and Flat-Nose versions, a combination cutter and pliers, and the Model 496 that opens a split ring and holds it. Ergonomically designed for close-up work, Xuron® Precision Specialty Pliers have an eye-friendly glare eliminating black finish, Light-Touch™ return springs and Xuro-Rubber™ cushioned hand grips. Providing optimum control and maneuverability in tight spaces, these specialty pliers are ideally suited for electronics and industrial assembly work, DIY home projects, and a host of hobby, craft, and jewelry making with thin wire, metals and beads.